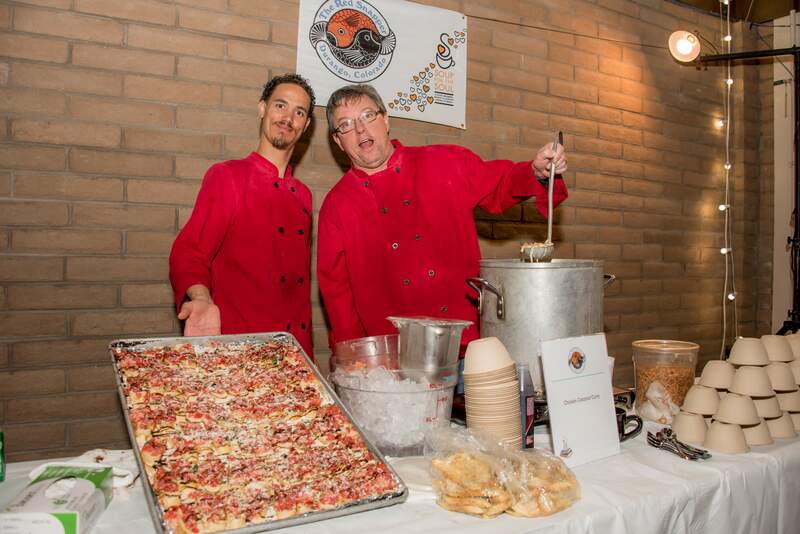 From left, Justin Bolton and John Sheehan of the Red Snapper show off their offerings at Soup for the Soul. The restaurant offered cold smoked salmon bruschetta and coconut Thai chicken soup, which was voted attendees’ favorite soup. 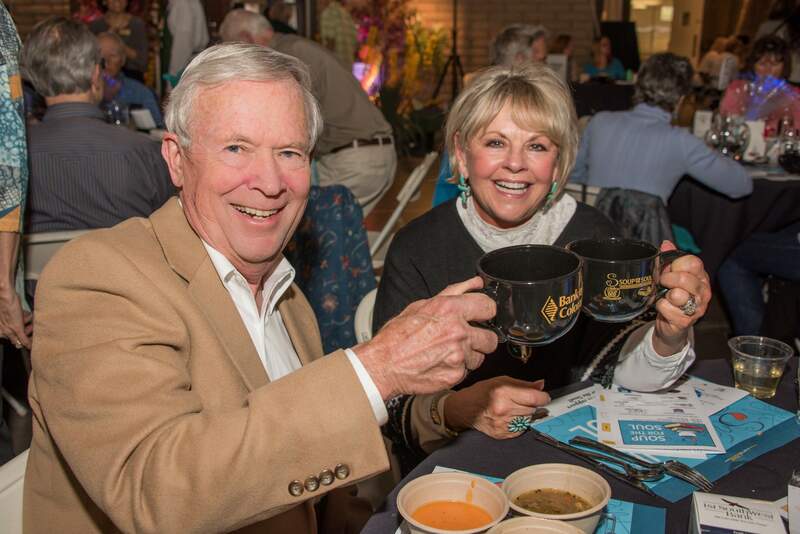 Soup’s on for Gary Treat and Suzanne Blumberg, who enjoyed Soup for the Soul, a fundraiser for Hospice of Mercy, on March 15 at the La Plata County Fairgrounds. Hospice of Mercy’s much-anticipated Soup for the Soul is one of the big fundraisers of spring – even if it took place five days before the spring equinox. The restaurants and the soup and appetizers or desserts offered were: Carver Brewing Co., truffled-wild mushroom soup and Mexican meatballs; Chimayo Stone-Fired Kitchen, smoked salmon chowder and caramel-almond popcorn; CJ’s Diner, chicken-green chili and dessert bars; Cyprus Café, spicy butternut squash soup with coconut milk and cauliflower rice salad with nuts and dried fruit; Durangourmet, Southern peanut soup and blackened shrimp with avocado; Eolus Bar & Dining, white bean and braised pork soup with sour cream garnish and gluten-free chocolate chip cookies; Garden Terrace Café at Mercy Regional Medical Center, roasted red pepper bisque; Hot Tomatoes, lamb stew with fennel and carrots and dessert bars; Mahogany Grille, smoked seafood Manhattan chowder and hazelnut blondies; Glacier Club, cream of local chanterelle mushroom with black-truffle oil soup and wild mushroom and spinach spanokopita; Mutu’s Italian Kitchen, chicken Parmesan soup and petite meatballs with porcini-mushroom sauce; Norton’s Catering, black-eyed pea soup and oysters on the half shell; Ore House, local Mangalitsa pork and Mortgage Lifter tomato-bean stufato and pork osso bucco on polenta; The Red Snapper, coconut Thai chicken soup and cold smoked salmon bruschetta; Seasons Rotisserie & Grill, green chile-pork posole; Zen Cuisine, green coconut curry chicken soup; and the Soup Palette, Michigan Red Chili and chocolate delight. If you’re not salivating by now, I give up. Congratulations go to The Red Snapper, whose soup was voted the best by attendees. And Jimmy Nicholson from Durangourmet, if you ever decide to bottle that Southern peanut soup, I will be the first in line to buy it. Steamworks Brewing Co. and Star Liquors provided the beer and wine. The Mercy Health Foundation – Chief Development Officer Karen Midkiff, Development Officer Joy Hess and administrative assistant Lauri Wilson-Lacy, along with event coordinator Kay Hoppe – organized the event. They decided to have just a few select items in the silent auction, and some spirited bidding ensued. Growing Spaces, a Pagosa Springs-based company, donated an 18-foot greenhouse kit, and Flight for Life contributed a 15-minute sunrise helicopter ride for two. Among the most popular items was dinner at Howard and Marjie Wilson’s beautiful Arts and Crafts home with Andrew Gulliford and a wine and dinner experience at the home of Gary and Carol Treat with Mercy’s new CEO Will McConnell. A private chef from the Ore House, a private “Eno Tech” wine “class” at Season’s, a photography adventure with Dr. Kim Furry, time in the studio with potter extraordinaire Nick Blaisdell and other assorted excursions rounded out the list. Animas High School students and the Durango High School Interact Club provided set-up and take-down manpower, and Native Roots Garden Center made the La Plata County Fairgrounds Exhibit Hall far greener than it usually is. So many sponsors made the evening a success, I can’t mention them all. Hospice is celebrating its 30th anniversary this year, and I’m sure I was not alone in remembering Myron “Father Mike” and Beverly Darmour, who co-founded the organization with a group meeting in their living room, for this momentous occasion. In 1987, Hospice was all volunteer and worked with just a few patients. The budget was $3,000, which came from a Coors Foundation grant and assorted bake sales, garage sales and craft shows. Fast forward to 2016, when Hospice staff worked with more than 200 patients and made almost 9,800 home visits. In 2011, palliative care, which is specialized care for people with serious illnesses, was added to Home Care and Hospice by Mercy offerings. Last year, 200 patients received care from one full-time doctor and four nurse practitioners. Anyone who’s been at Mercy recently has seen construction moving apace on the new hospice residence. Due to open late summer, it will provide a nurturing environment for those reaching the end of life who need a place for their final days. The Mercy Health Foundation has only $300,000 of the $5.7 million remaining to be raised for the project. To learn more, call 764-2800 or visit www.mhffnd.org.